When you see blood oranges and tangerines in grocery stores in my neck of the woods, you know that it's citrus season! Vitamin C- loaded fruits such as oranges and pink grapefruit always taste best when in season. Even though these fruits are tasty on their own, this recipe is a special treat. The combination of fruit and basil, along with the slight tang of vinegar, is one of my favorites. For all citrus fruits, slice into 1/2" slices then cut off peel. Cut each slice into 1-2" sections, carefully removing seeds. Combine citrus chunks in a large bowl with basil. Slice mozzarella into 1" chunks (if using small balls halve them). 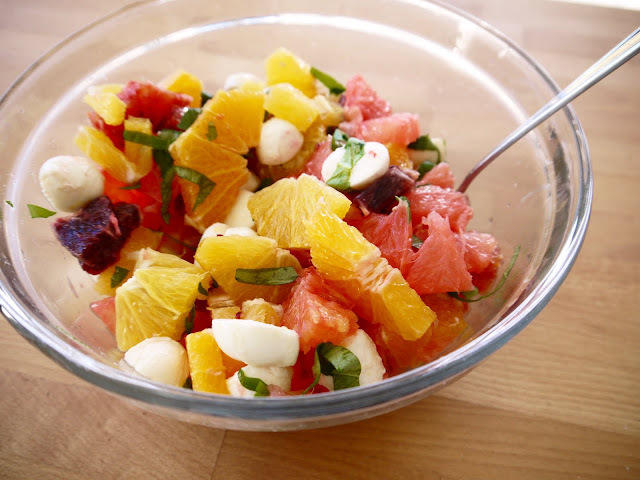 Gently toss mozzarella with citrus and basil. In a small bowl, combine olive oil, vinegar, salt and honey. Whisk until combined, then pour mixture over the other ingredients. Toss and cover. Place in the refrigerator for 30 minutes prior to serving. *Note this recipe does not store well overnight.